Manchester United marked their return to Champions League football with a 3-0 win over Basel at Old Trafford on Tuesday night. Manchester United Midfielder Paul Pogba will undergo a scan later today to confirm the extent of the injury he sustained in their 3-0 champions league opening group game against Basel on Tuesday night. Pogba who was handed the Captain’s band for the night by Jose Mourinho limped off the field in the 19th minute of the encounter after suffering what looked like a hamstring injury and was later pictured leaving Old Trafford in crutches. Romelu Lukaku nodded Daley Blind’s cross into the net in the 53rd minute to make it two before Marcus Rashford came off the bench to seal the win in the 84th minute. It was no doubt an impressive start to their 21st campaign in the Champions League and a good way to bounce back from the draw at Stoke City last weekend. 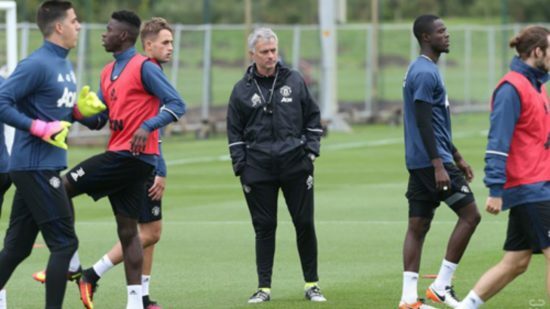 One thing Jose Mourinho loves about his team this season is the strength in depth. He has good replacement for every position and to an extent, three or four options for some. Many of his players are also not limited to one position. The Portuguese Coach made six changes to his starting-eleven on Tuesday including an entirely different back four. They went on to play like Mourinho would have wanted and he will be glad to know that he can rest some players when they schedule is getting tighter. As against what we experienced for the majority of last season, United have rediscovered their scoring touch and we are beginning to see wins of big margins and not 1-0 wins or unnecessary draws. The arrival of Romelu Lukaku has been very productive while Marcus Rashford has shown he’s starter as they both marked their Champions League debut with goals. The way the likes of Anthony Martial, Henrikh Mkhitaryan and Juan Mata have been very effective on the pitch is impressive and Mourinho looks to be happy with the way things are going. Pogba left Old Trafford with crutches on Tuesday night and that was the low of the outing. The Frenchman has formed a very smooth partnership with new arrival, Nemanja Matic and Mourinho will now have to look up to the likes of Ander Herrera, Michael Carrick and Marouane Fellaini. While one might say United have got good replacements, the fact remains the 24-year-old will be missed for his uniqueness. Going forward, United are looking great again!